Pack of 2 fluorescent light bulb Replacement UV light tube for the UV-16 and POS-15 units. The UV-16 uses a patented 8-watt fluorescent light bulb. We manufacture this bulb ourselves, and no other factory in the world is allowed to produce it. This 8-watt bulb offers 2x the power of the “standard” bulb in its class. This “double power” enables greater ease of viewing the glowing fluorescent security features, since the added UV illumination will make the features glow brighter and more clearly. Click here to order Replacement Bulbs. The UVF861 tubes are a proprietary part designed and manufactured by Fraud Fighter™ Products. These tubes are high-efficiency fluorescent bulbs, functioning at 30,000 Hz. It is VITALLY IMPORTANT that products designed to use the UVF-861 bulbs do not have a different replacement bulb part number used with them. Doing so would invalidate the warranty on your machine and could be hazardous. 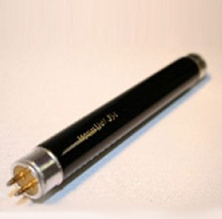 Replacement UV light tube for the UV-16 and POS-15 units.